Thanks to a frequent contributor to RTE for sending the following video that takes the viewer on a tour of One World Trade Observatory that opened on May 29, 2015. Americans & freedom lovers everywhere can celebrate & cherish the triumphant achievement of rebuilding the previous WTC complex site that was destroyed on September 11, 2001 when Islamic Fascist terrorists flew airplanes into the Twin Towers. "As a city, Babylon exists no more. When those energizing human forces that built & maintained the city for thousands of years were withdrawn, it soon became a deserted ruin." - George S. Clason, The Richest Man In Babylon, page 138 – first published in 1926. Although writing about Babylon, Mr. Clason describes the downfall that lies ahead for California if the state does not renounce its sanctuary state policies. John Cox, candidate for Governor of California, offers the leadership to reverse California's own slide into ruin as described hereinafter. California runs a gubernatorial primary on June 5 & the top two vote getters move to the general election in November regardless of party affiliation, meaning that Republicans have a chance to be on the general election ballot with John Cox – shown in the above graphic in second place in the March 21 poll. The January poll showed Lt. 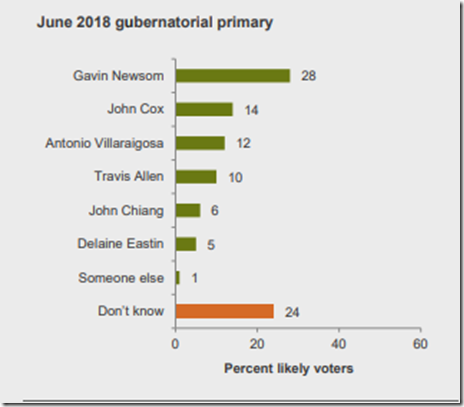 Governor Newsom ahead 25% to 7% so it has somewhat tightened & is much improved from the December poll. Otherwise the general election for California governor would be between the former mayor of San Francisco (Newsom) versus the former mayor of Los Angeles (Villaraigosa) – both Democrats. 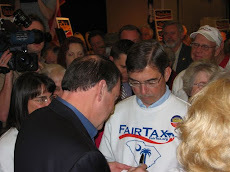 Readers of this blog first learned of John Cox in January 2007 when Al Stern, Vice President of the Sun City Hilton Head FairTax Club, reported in the Island Packet that Mr. Cox was the first presidential candidate to visit Beaufort County, SC – a regular hotbed of presidential candidates every four years. 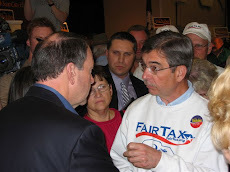 Mr. Cox had been the guest of the aforementioned FairTax Club earlier that month & as Mr. Stern reported his "impassioned support of the FairTax" was very impressive. In 2007 Mr. Cox was an Illinois businessman & many of the readers of this blog, after looking @ his positions on the issues, thought we were more in agreement with him than any of the other candidates @ the time, & accordingly tried to get him in the June 5 New Hampshire presidential primary debate – which he had been excluded from for more reasons than one – like he had little or nothing to do with the establishment positions of the two major political parties & he was simply for America. John Cox is first & foremost a successful businessman & CPA who built his own business from scratch to a $200 million company with approximately 100 employees – just about my most desirable qualification & first requirement to be able to run for President. During his business career Mr. Cox made time to serve on Jack Kemp's national steering committee & as Newt Gingrich's California Finance Chair. He is endorsed by the California Pro-Life Council. Mr. Cox strongly opposes California's "Sanctuary State" policies & laws, such as Senate Bill 54, that mandates & expands protections for undocumented immigrants including actually prohibiting state & local police agencies from notifying U.S. Immigration & Customs Enforcement (ICE) officials when illegal immigrants in their custody, who may be subject to deportation, are about to be released. Thirty-two year old Kate Steinle was killed on July 1, 2015 in the arms of her father by a bullet shot from a gun by Jose Ines Garcia Zarate, a criminal & illegal alien who had been deported from the U.S. five times, & was again released from custody instead of being turned over to ICE before Kate's death @ his hands. Zarate has since been acquitted both of murder & involuntary manslaughter charges after his attorney successfully convinced a San Francisco jury that the shooting was accidental & the bullet ricocheted off the ground & traveled 80 feet before killing Kate. This of course overlooked the fact that Zarate should not have been in the country in the first place & that if he wasn't Kate would still be alive today. Current California Governor Jerry Brown has gone even further than just not cooperating - by choosing to not have his state live under federal law & has instructed California's counties, cities, & businesses to follow suit or face state criminal charges. That's right California will fine businesses &/or imprison people who cooperate with federal immigration law. But so far a rapidly growing list of a combination of 19 cities & counties have started to resist or fight back, including Los Alamitos, Yorba Linda, Buena Park, Huntington Beach, Mission Viejo, Fountain Valley, New Port Beach & most recently San Diego County – the second largest county in California - by planning to file a law suit against California challenging the legality of state mandates that expand protections of illegal aliens. And the Orange County Board Of Supervisors voted to join a Trump administration lawsuit that contends that the California laws obstruct federal immigration laws & violate the Constitution's Supremacy Clause (Article VI, Clause 2) – a conflict-of-laws rule specifying that certain national acts take priority over any state acts that conflict with national law once federal power has been validly exercised. In addition, Orange County Sheriff Sandra Hutchens intends to publicly post online the release dates of jail inmates — including those in the country illegally. Of course John Cox is totally behind the cities' & counties' resistance & if elected Governor will work to reverse all of Jerry Brown's destructive work in the Golden State. 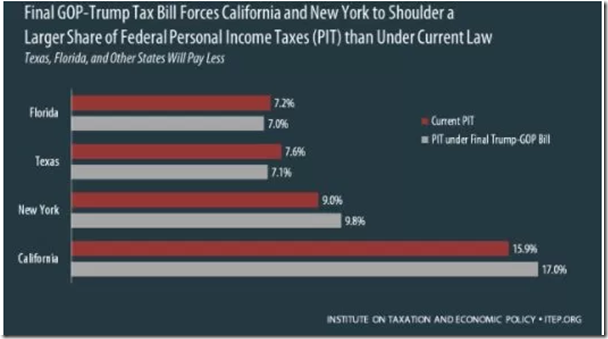 California has the highest marginal state income tax rate (13.3%) in the country, the highest state sales tax rate (7.25% but varies by district with 9.5% in LA), sky-high gasoline taxes including a recently passed $52 billion gas tax increase, car registration fees, traffic fines, high utility rates, & high crime rates & large homeless encampments in many areas. The state ranks dead last in friendliness to business, has the highest poverty rate in the country, a growing unfunded public pension liability that has reached a critical stage, & a huge public retiree healthcare liability that has not even begun to be funded – all of which hurts the middle class & that is why they are finally fighting back as described above – or leaving California. People have talked about the one way U-Haul contracts going form California to Texas for years – this may be an exaggeration because the U-Hauls are going from California to plenty of other states as well – like Oregon, Michigan, Arizona, & Idaho. The Orange County Register reported that in 2016 (July to July), 142,932 more residents exited California to live in other states than arrived from other states. This domestic net outmigration was the second largest in the country behind New York & just ahead of Illinois & New Jersey – there is a clear pattern here of the type of states Americans are leaving for other states. But California's population increased by 240,177 (source – Census Bureau) in 2016 primarily through foreign immigration & a natural increase of 214,000 (i.e., more births than deaths - 1 birth every 8 seconds in the U.S. & 1 death every 11 seconds). In short, in 2016 the number of people of higher education & means that left California was exceeded by the number of poorly educated low skilled people who entered California – hardly a winning combination for economic growth & prosperity that you would want to raise your family in. Up until now career politicians like current Governor Jerry Brown & Lt. 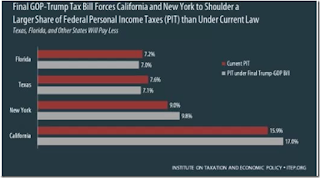 Governor Gavin Newsom, who is leading in the above graphic poll for governor, found nothing wrong with any of the above financial facts but the Trump tax cut bill added a new wrinkle – like how is the above level of financing going to continue in light of the the state & local tax (SALT) deduction restriction in the Tax Cuts & Jobs Act of 2017 that is likely to accelerate people of substance & means leaving this high tax & high cost state. The Sacramento Bee reported that Californians will lose a collective $12 billion because of the caps on the SALT deduction with 43,000 people who make over $1 million per year paying three quarters ($9 billion) of that money. This comes to an average of over $209,000. You can judge for yourself why Nancy Pelosi called the Trump tax cut bill the "worst bill in the history of Congress" by looking @ her Financial Disclosure Report of 2016 – Pelosi has assets that very well could generate $10 million of income per year thereby putting her well into the category of Californians with large federal income tax increases as described above. It is safe to say that Pelosi is more concerned about her own personal 2018 federal income tax liability than she is about the $2,000 worth of "crumbs", as she called them, that people in the middle class will receive in lower federal income taxes in 2018. See graphic below for comparison of the share of federal personal income taxes that residents of the four largest states pay in 2017 & 2018. By electing John Cox Governor of California this fall the people of the state have a real chance to turn around, both financially & culturally, the terrible manner, way, & mode of life described above - lousy conditions that no one in their right mind would want to live under where the state government fights the federal government using American citizens as disposable pawns @ every turn while favoring illegal aliens wherever they find them. But it is not just California that is involved in the sanctuary state imbroglio – other states & their municipalities across the nation have been drawn in. For instance, on a positive note, Iowa passed legislation earlier this month that directed Iowa law enforcement agencies to fully comply with ICE detainers & banned sanctuary city policies in the state. But on a negative note, New Jersey's new governor Phil Murphy has signaled a desire for New Jersey to become a sanctuary state. If you live in California, or have relatives or friends who live in California – & I know of several such subscribers to this blog, & have already talked to some – I urge you to alert California voters to consider John Cox's candidacy for governor & check out his website. A movement has started & California has a top notch candidate for governor, as described above, to reverse the certain ruin that lies ahead, so Californians have a chance – I hope they make the most of it. Thanks to a charter member of RTE for sending me, just in time for income tax day, the animated version of how ten men who want to pay their beer bill the way we pay our income taxes run into problems. Long time readers of this blog will remember the referenced post below of August 2012 that presented the unanimated version of this same lesson. The Urban-Brookings Tax Policy Center, a non-partisan research group, has estimated both the incomes & federal income taxes for the 175 million American households by dividing them into quintiles, each consisting of about 65 million people, for 2017 & 2018. See graphic below that shows in 2018 people in the four bottom quintiles are all projected to pay lower shares of the federal income tax – i.e., tax cuts – & only people in the top quintile are projected to pay a larger share than they did in 2017. 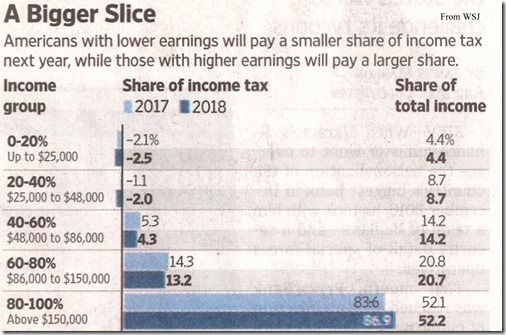 Actual data from the IRS are not available for a few years after returns are filed but the above estimate pretty much follows previous distributions of income & federal income taxes – see graphic below for 2014. "There's nothing in the Constitution that grants to the Supreme Court the final word as to whether or not an executive act or a Congressional enactment is constitutional. This is a power that the Supreme Court simply arrogated to itself early in our history. The Constitution enumerates the preeminent powers of Congress in Article I & gave the President the authority to veto any enactment subject, however, to a veto override vote by a super majority of Congress. Nothing in the Constitution suggests that the Supreme Court could override the acts of both the President & the Congress & certainly its drafters could not possibly foresee a situation where hundreds of Federal District Court Judges could do the same with each of their decisions to be given nationwide effect. 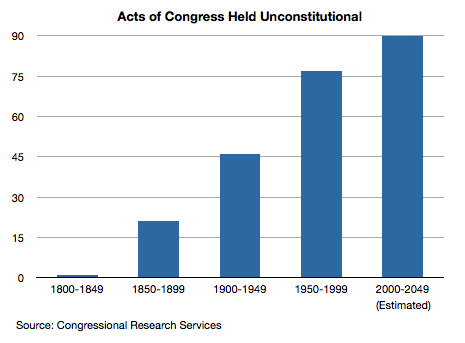 It's time for both Congress & the President to reclaim their constitutional prerogatives." – Robert Levetown commenting directly on WSJ.com regarding my letter published March 20 in both the print edition & the online edition of the WSJ. My letter showed how the elected branches of both major parties have given up their turf over the years in favor of the courts providing cover regarding contentious political issues they have no business being in. Students of landmark Supreme Court cases will instantly recognize that the above highlighted parts of Mr. Levetown's comment refers to the decision in the Marbury v. Madison case of 1803 in which Chief Justice John Marshall & the Supreme Court unilaterally "determined that it had the power to decide cases about the constitutionality of congressional (or executive actions) & – when it deemed they violated the Constitution – overturn them. The shorthand label given to this Court-made authority is 'judicial review'." – Mark Levin, Men In Black, page 30. Originally, "the courts followed British common law. They ruled on criminal law, matters of equity between individuals & businesses, & other legal matters." Ibid, page 24. In short, the Constitution contains no such judicial review clause meaning Chief Justice John Marshall & the Supreme Court made the largest power grab in the country's history – & it is the basis of judicial activism today. Background – In the two week lame duck session from when the election of 1800 was decided by the House of Representatives until President-elect Jefferson took office President John Adams made several changes to the judiciary designed to hinder Jefferson's new administration including, on the day before Adams' term expired, appointing 16 Federalist circuit judges & 42 Federalist justices of the peace. William Marbury was one of these so-called Midnight Judges. The Federalist Senate approved all of the appointments but in order for the commissions to go into effect they had to be delivered to those appointed. The problem was that there was not enough time for all of them to be delivered before the swearing in of Jefferson who immediately, upon becoming president, told his Acting Secretary of State to not deliver the remaining appointments. Jefferson considered the undelivered appointments void. sided with Marbury because, for goodness sake, it was Marshall & his brother who were delivering the commissions the day before Jefferson's inauguration – Marshall was not only the Chief Justice of SCOTUS but John Adams' acting Secretary of State. See the referenced post below for my letter published in the WSJ on November 4, 2011. If there ever was a person who should have recused himself from a case it was John Marshall in Marbury v. Madison, but even so Marshall heard the Marbury case in spite of everything & found that section 13 of the Judiciary Act of 1789 that enabled Marbury to bring his claim to the Supreme Court was itself unconstitutional because it purported to extend the Court's original jurisdiction beyond that which Article III of the Constitution established - thereby denying Marbury's commission. In essence the case was decided on a technicality, 4 to 0 by the Supreme Court, in President Jefferson's favor in that the Adams' appointments which had not been delivered on time were now null & void. In addition the now Jeffersonian controlled Congress enacted the Judiciary Act of 1802 which abolished the new judgeships created by Adams & the Federalists as described above meaning the electoral process worked – with no need for the judiciary to be involved in the case. But John Marshall was much more of a master politician in 1803 than he was a Chief Justice of SCOTUS. With a Republican majority elected to both chambers of Congress in 1800 thereby complimenting the Republican President Jefferson, Marshall was scared to death politically of Jefferson. Marshall wanted to stake out what territory he had left & he thought establishing judicial review in the Marbury case was his best way forward – thereby turning a blind eye to both his Federalist friend-Marbury's claim to a judgeship & more importantly to his belief that Madison's refusal to deliver the commissions was illegal & correctible. Another recent comment I received sums this one up – "Doug, I'm sure you are aware of the fact that justice & the U.S. legal system have nothing to do with each other." Marshall realized the two elected branches could remove him from office & even impeach him. Marshall knew that if he ordered Madison to deliver Marbury's commission that Jefferson would order Madison to ignore the Supreme Court writ thereby weakening the Court's authority. Better to let Jefferson win the case & deliver the coup d'état regarding the Court's judicial review self-proclaimed authority that upset the Constitution's balance of power – a masterful political stroke only if he got away with it. But Jefferson was not satisfied with a win in the Marbury case because he knew the judicial review part of the ruling was just not right – he immediately saw the danger of judicial review & the plans of the declining Federalists to retain power through the courts when he wrote after the Marbury decision "They (the Federalists) have retired into the judiciary as a stronghold. There the remains of federalism are to be preserved & fed from the treasury, & from the battery all the works of republicanism are to be beaten down & erased." Jefferson spent the rest of his life arguing against judicial review like in his letter to William Jarvis: "To consider the judges arbiters of all constitutional questions (is) a very dangerous doctrine indeed, & one which would place us under the despotism of an oligarchy. Our judges are as honest as other men & not more so. They have with others the same passions for party, for power, & the privilege of their corps . . . & their power the more dangerous as they are in office for life & not responsible, as the other functionaries are, to the elected control. The Constitution has erected no such single tribunal, knowing that to whatever hands confided, with the corruptions of time & party, its members would become despots. It has more wisely made all the departments co-equal & co-sovereign within themselves." Think for yourself – if someone is going to decide whether an action of the elected branches is constitutional, or not, would you rather take your chances with the possibilities of terrible decisions by our elected representatives who can be replaced every two, four, or six years or have unelected judges with life tenures overrule your elected representatives with no remedy for decades, if ever in your lifetime. In any case it is going to be human beings deciding the matter – people with human imperfections & frailties just like the rest of us as Jefferson pointed out above regarding judges. It is just common sense for me to want to have every decision as close to home as it can be so that We the People of the United States control our own destiny. But Jefferson never had to personally worry about the effects of judicial review again during his presidency, or during his life for that matter, because John Marshal never invoked, cited, referred to, or mentioned judicial review again during Jefferson's term in office. Indeed, Marshall died on the bench as Chief Justice in 1835 never bringing up judicial review again after Marbury v. Madison. Only once in the first 81 years of our young constitutional republic was judicial review invoked – in Marbury v. Madison. Presidents Washington, John Adams, Madison, Monroe, Quincy Adams, Jackson, Van Buren, Harrison, Tyler, Polk, Fillmore, & Pierce never encountered judicial review during their presidencies. I refer to the period from our founding to the Civil War as the liberty to abundance stage of our history – the period in which liberty & freedom were cherished & even worshipped by the people including the elected representatives. The only entitlement people living in this age were looking for was the rights guaranteed by the Bill of Rights – summarized as the freedom from government intrusion in their lives – & there was no judicial activism during this time to turn the world upside down. Today rights are most often thought of as entitlements to something from government like the aid relief package from Superstorm Sandy. People living in the first third of our country's history never had problems waiting for relief packages because the government did not offer any in the first place & the people relied on themselves & were better for it. After Marbury v. Madison the next case in which the Supreme Court found a law (the Missouri Compromise of 1820) unconstitutional was the Dred Scott v. Sandford decision of 1857 in which seven members of SCOTUS ruled in one of the worst decisions in history that Blacks could not be citizens of the United States. Seven people held that power after all the progress made over the years – a very sad commentary but one that would be corrected. President Lincoln described judicial review & the Dred Scott decision clearly when he said in his first inaugural address "The candid citizen must confess that if the policy of the government, upon vital questions, affecting the whole people, is to be irrevocably fixed by decisions of the Supreme Court, the people will have ceased, to be their own rulers, having to that extent, practically resigned their government, into the hands of that eminent tribunal." The graph below shows the timeline for how the judiciary has increased the use of judicial review to the point it has become a major tool of judicial activism – what can't be won @ the ballot box is taken to the courts, where judges with lifetime tenures provide cover for our One Big Government party with Democrat & Republican wings who take turns being in power like the one big happy family they are. Since 1999 there have been 22 occurrences of the Supreme Court declaring a law unconstitutional thereby matching the total on the entire 19th century. The WSJ listed the following examples of recent judicial activism involving state Supreme Courts hijacking policy debates: 1) blocking a teacher tenure reform in NC, 2) pension reform in IL, 3) a charter school law in WA, 4) education savings accounts in NV, & 5) usurping the legislature's authority by redrawing the state's congressional map in PA that will help liberals pick up three or four House seats in November's midterm election. To paraphrase the great libertarian Rose Wilder Lane - For sixty known centuries millions of people lived on this earth in slavery & famine, suffering one human hardship after another. But not until the unleashing & releasing of human energy, & then only in the United States, did peoples' lives improve so that they no longer lived in floorless hovels without windows & chimneys unable to feed themselves. After six thousand years it took one century for the American genius of limited government, personal responsibility, & free enterprise to create the whole modern world where every convenience is taken for granted. Judicial activism is one of the self inflicted setbacks to our continued prosperity & progress moving away from statism & its occurrences are increasing as the graph below shows. One of the mindset changes needed today is to recognize the excellence of the first third of our history as described above & work to return to it. Judicial activism is one of the main thieves preventing this return.